The last few races of the year are just around the corner and au revoir to serious training for a while. This weekend I'm racing the CO state road race chanpionship in Grand Junction, next weekend is Gore Pass RR, and then next weekend is the Parker Omnium (7mile TT, 100m RR, criterium). 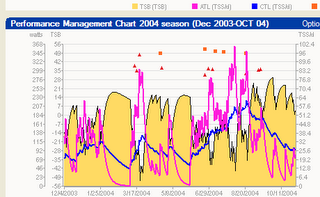 I've pasted in my WKO+ Performance Manager charts for 2006, 2005 and 2004 seasons. The biggest thing to take note of is I am currently sitting at a chronic training load (CTL) of 80 and this is a good 30 points higher than any point in the last two years. You can see how it has risen steadily all season long. Now of course a CTL of 80 is not that high when it comes to training for pro/1 level road racing, but 80 for me now is a huge accomplishment when trying to manage work and family life. Most of my week's end up being 10-12 hrs of training and I have a few 14 and 15hr weeks recently which has pushed things up. I'd say the majority of national level elite riders are training up near a CTL of 120. One of the thing's I'm pretty happy with at this time of the season is my training stress balance (TSB) is up to 1.4 as of today. Now with some good easy rides and a pit of intensity next week I should going well for the last two race weekends of the year. I'm also hoping som new critical power records can be set in the coming weeks once get some freshness back. I hope everyone's training is going to plan. Make the most of what's left in 2006! How did you determine your threshold power? How often do you change that level? What would be best practice (practical best practice)? I worry that before comparing CTL, etc., the method of establishing threshold power needs to be discussed/compared. 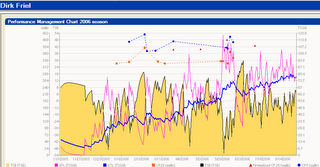 My FTP (functional Threshold Power) is based off of my 60-minute mean maximal power. I have this set at 350w as I have rac efiles which show 30-minute max values of 365w+. I simple rule of huimb is to subtract 5% from your 3-min time trial pace to estimate your 60-min. TT value (also known as FTP/CP60/MMP60). I really do not change this value all that much other than in times of dramatic fitness loss or gain. My CP60 in Januray is certainly lower than it is in June so there will be some changes between those dates, but I do not change my FTP on a weekly basis. As I get data which shows an increase I will bump it up, and I instinctively knwo when it is lower. My first true test of the year is always the Valley of the Sun TT in AZ which is just over 30 minutes for me. This tends to establish my early season FTP values which I can then bump up if I see better data along the way.